I have been a busy little bee around here. How about 30 + Easy Spring/Summer spray painting projects for you. What a difference spray paint can make! You can freshen just about anything up with Spray paint. Painting, sprucing , prepping, planting. My gosh you would think someone important was coming over. so I always try to do my best. I seemed to be loving green and blue this summer. My Roo’s all got a fresh coat of Avocado green. You may have laughed when I said I must be having someone important over. It is true though, you never know who is lurking your blog. Just a reminder, COUNTRY WOMAN magazine spread on us will be out soon.You can see my magazine spread on my sidebar. Don’t you just love Color and how it can brighten up your mood?! Speaking of BLUE…I had some chalk paint left and this piece was in sad shape. I left it out all winter long, and thought I would try my spare chalk paint. It totally brought it back to life again. You may want to check out my Spray paint gallery while you are here! Hey Debbie…I tried 4 times to get the party button to load into my post. I couldn't get it to work. So I pasted the blog button with your link right underneath. Have you had anyone else tell you they had trouble? I was so frustrated! I will try again later. Maybe Blogger was just being a pain. Oh…LOVE the blue table! Thanks for hosting this great party. yeah! So excited that the party has started! Everything you painted looks so lovely. I love what you did with the candle holder and the pot and plant…so cute! Debbie I also had trouble with the party button, and did the same as Ann did. It all looks so inviting and relaxing! Love the pot inside the glass – thing 🙂 — hope you're able to enjoy it all without getting eaten alive by mosquitoes where you are! We have to stay in the screened gazebo — can't enjoy the yard or porch at all this year! Thanks for hosting Debbie! I love the little piece you re-vamped! It looks so cute with that yellow pot in it! Same problem here with the party button — it doesn't seem to be a complete url . . . I've tried several times to get the button to work, Debbie. I gave up and just linked it to your blog for now. I'll be back in a bit to try again. I need to go have Father's Day supper on the patio with J, at the moment. Back in a bit. Hi Debbie! Thanks so much for hosting this fun paint party. I thought about taking the rock painting seriously, but since it's been 103 degrees here for 4-5 days in a row now, I decided against it. Of course, your projects always look great! You always inspire! Love this big party! I ended up copying the button and url address to your blog – I couldn't get the url to the party post to come up, so I just used your general blog address. Don't you love technology- especially when it goes berserk right at party time??? Love your porch Debbie, thanks for hosting this great party… hope your having a great weekend..
Hey Debbie, Thanks for hosting the party! I had some issues with the Self Crop part of Linky Tools and ended up with no photos, so please feel free to delete entries #17 & #23. I was able to re-enter them using the Auto Crop. all linked up my fellow party host! Hi Debbie, Thank you for hosting! Love your deck, looks like a fun place to relax. and I love the new color on your candle holder. Your deck is looking good, Debbie! A far cry from when the windstorm blew in a few months ago! Thanks for hosting!! Hi Debbie ~ First of all, thanks for hosting! I love your green paint, it really pops on your deck. I, too, had trouble with the button. So I hope my link is ok.
Hi Debbie, your deck is gorgeous, love the blues and greens. Thanks for hosting this fun party. Hi Debbie, thanks for hosting. I LOVE your deck with all those yummy summer colours. I am finding myself drawn to blue and green this summer too. And your Roos looks great in that green. Blue & green are so complimentary… I love that color combo. Your deck is looking fabulous & all set for a great summer! Love your deck. It looks so relaxing. I could not get the linky to add to my site, so I posted a "copy" of the linky. So sorry. Cant wait to see the other parties. Hi Debbie, Your deck is wonderful and it looks like you are up in a treehouse among all the trees. What a great colorful patio, I am loving that rug, is it in door out door? I am such a nerd I do not know how to link a button. When I copy the button html it comes up as just html garble on my post….I am a nerd!! I have been meaning to ask someone how to do it!!! Thanks for hosting this great party!! Your deck looks great. The rooster is adorable & I absolutely LOVE the rug!! Looking good. Looking forward to the partay this week. Everything is looking wonderful at your place, Debbie. Loving your green rooster..but he doesn't really look avacado to me…at least not the 1970's avacado. I love all of your green and blue items that you have painted. That rug on the deck is awesome. Your deck looks like the perfect place to relax and have a summer cocktail. I love your new outdoor rug and beautiful deck. The deck is beautiful, so relaxing and inviting! Love all the colors. I can imagine sitting in your lounge chair, sipping sweet tea and reading from my kindle. Well, your deck looks better than mine right now. I really need an umbrella for shade, but not happening right now. Love your painted projects and good turn out so far. I have so much to do plus unpack and I have to go pick up Bailey tomorrow. Thanks for linking me up while we were flying home. I've missed a couple Parties while on vacation, but I'm back and ready to blog. Looks like another great party. I love the deck by the way. The rug is perfect under the lounge chair. Thanks for hosting Debbie! I had a problem with the button too, but I linked back by copying the pic and adding your html…anywho, I love the partay and your stuff looks great!! Our internet is very slow today. I finally see the comment box! LOL just to let you know your comments are working! Nice pictures, great details of this terrace. Thanks for hosting, Debbie! Looking forward to seeing what everyone else has done! Yay! This blog party has been on my calendar all month. So excited it's starting. Love all your paint projects! You're always such a wild woman with color. Love it! Thanks for sharing and for hosting. This is just wonderful Debbie! 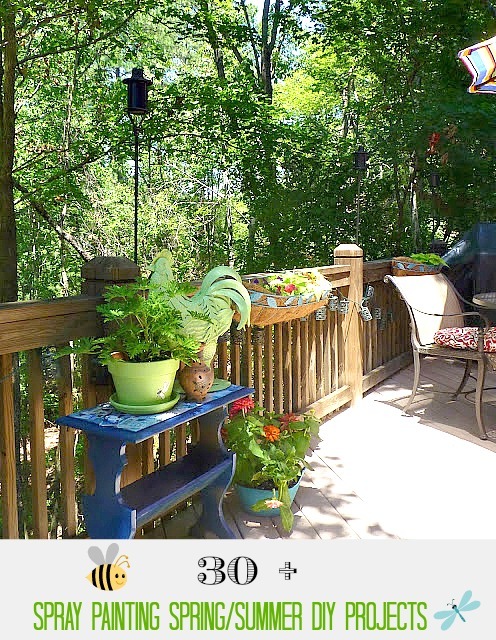 I love your deck and the beautiful touches, so fresh and cheerful and inviting too! I am going to try to link up late today! Great idea! I have been promoting and spreading the word. I have the buttons and links in my most recent post. The only thing that is not yet completed is a project! Looking forward to the Country Woamn spread. FYI!!! You don't have a link in this post to At The Picket Fence. Just thought I might point that out. You say to check out Vanessa's party with no link. Thanks for hosting, Debbie! I shared our summer kick-off vacation in upstate NY. You have a fantastic designer touch! I love what you did with that glass container. It's just very creative, and beautiful! Great idea for a Summer Blog Party!! This is going to be so much fun!! Love your deck and especially the monogrammed watering can! It all looks beautiful! Hi Debbie!So excited about this party and your giveaway, I love the Shasta plug in:)! Your deck looks beautiful, I am a huge fan of the green and am currently working it in anywhere I can outside!! I also had trouble with the URl. It gave a little box and if you click on it it brings you here, but there is not image. I will try to add a little something and hopefully it will be fixed soon, it is such a cute button! Your deck look awesome…as well as all your other paint projects. Thanks a bunch for this fun party. Great Deck! I'm your newest follower. OK girl, I'm ready for a good party! This looks like it could get wild and crazy! I can't get the button on my blog…help? Everything looks great ~ as usual! I love the ambiance of your deck. I am loving that green rooster. You are inspiring me to see what I can paint green. Love your deck! Looks so inviting! Thanks for the party! I was able to post the party button ok on my blog. love a good summertime party. Your deck is beautiful! I'm so jealous…I love the rooster and the rug. Your deck looks great Debbie! It looks like a fabulous place for entertaining family and guests. Love the new and fresh look you gave the vase. Way, way behind. But I'll try to play this time. I just wanted to let you know that it's great to see that your deck is back in order. What wonderful colors you have picked this year. I want that rug. I need that rug. Please, please let us know where you got that rug. Your deck looks fantastic. I love all your painted accents. Thanks for hosting this fun blog hop. Debbie, Your deck looks so cool and inviting. Love your colors and all that shade. Hey Girl!!!! I'm back and I want to come sit on your deck! It looks awesome! I love the greens and blues together. So summery and soothing! Lucky you- got to get the party started. I linked up and am looking forward to all the inspiration. I love your blog!!! That tea towel is so cute! Thanks for the party and the comment on my blog. I love the bright, unexpected green of the rooster! I'm not really a "bright" girl myself, but I love the way you pull the look off in your home. Everything always looks so happy and cheery in your house. Love it! Thanks for hosting the block party! Thanks for hosting!!!! I'm really new in Blogland! I love your work! Love everything on your deck especially that rug!! You keep changing your colors on me!! LOL! I am still looking for the yellow!! I get how it's all shared now..lol Saves time entering all over….you always host such great parties. great ideas! thanks for hostessing! Your deck is so inviting! Ok I could be here all night and into next week, over 500 folks at this party…..whew that is like one of those big Catholic weddings I once went to with 500 people HUGE!!!! I had trouble linking in to the party, clicked the back button and ended up with two of the same exact post. Could you please delete #819. Thanks! WOW!!! What a turn out!! I hope I did it right. I was a bit confused (still am) about where, what, etc… But I'm a little slow so bear with me, lol!! Anyway, thank you so much for hosting!! I wish I had a whole week just to check out all of the links!! They all look so interesting! !